The following is an excerpt from “The Genealogy of the Descendants of John Clough of Salisbury, MA,” Vol. 1, pps 13-19. When the legions of the Roman Empire swept into the region of the Caucasus Mountains, the tribes of Celts and later the Teutons fled northward through Europe until the barrier of the Atlantic Ocean stopped their wanderings. During those many centuries a restless spirit possessed these homeless tribes and this became a dominant element in their characteristics. The love of freedom that impelled them into the northern forests has persisted through thousands of years. 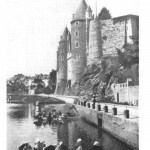 In the ravines of Brittany the Lords of Rohan claimed their domain and erected their castle, said by historians to have been the progenitors of the Clough Clan. This genealogical record of the Family of John Clough demonstrates the independent, restless traits of that Englishman who preferred exile from his native home to subordination to a government that demanded a compromise with his religious convictions and prevented him from establishing his family upon the soil of England. Through ten generations, this restless urge has induced this family to scatter into the four corners of this nation. To plot the migrations from Salisbury, Massachusetts is a fascinating pastime. To compile a list of predominating traits might prove to be a worthwhile pursuit to a student of family relations, for the thousands of names in this record belong to a typical American family. Since confusion is widespread about both the spelling and the pronunciation of the name of this branch of the clan, at the outset of this genealogical record it may be wise to state that the original founder in New England wrote his name, John Clough. He so signed legal papers and also his will. His sons spelled the name, Clough, and it is so engraved upon the headstones over their graves. The pronunciation is determined more by inference than by definite proof. On the list of passengers of the Master of the Rolls in London, the name of our ancestor is spelled, Cluffe, which seems to be a convincing indication that in the presence of the officials the name was pronounced as it was spelled. Whether John Clough registered or another person represented him, the spelling seems to prove the pronunciation. If John Clough knew of this spelling, he did not correct it. If he desired to conceal his identity, he may have preferred this spelling. Another proof of the pronunciation is found whenever the name was written by a person other than the owner. In lists, on pension papers, and especially when a man made his mark the name is spelled, Cluff. This proves that the owner so pronounced his name. Both the spelling and the pronunciation have become optional among the later generations of the John Clough Family. Descendants of other Cloughs who migrated to Boston pronounced the name, Clow. Many of the John Clough Family did in Boston as the Bostonians did and changed the pronunciation to Clow. When another group of the John Clough Family settled in the pine lands of Maine, they spelled the name, Cluff, doubtless to emphasize the pronunciation, and their descendants still keep this spelling. Let it be understood that when the founder of this Family established his legal rights in New England, the original name as he wrote it is John Clough and is pronounced Cluff. In an article by a reliable authority upon genealogical research, copied from the New England Genealogical Register, an assertion reads, “According to the custom of ancient times, the family took its surname from the place of residence.” This custom obviously applies to the Clough Family. Based upon the highest English authority, it is safe to presume that among the craggy ravines of the coast of Brittany in France the progenitors of our family were so distinctly established that either they assumed the name or their neighbors called them by their place of residence:- The Ravine Men – Cloughs. Among the Celtic tribes, not only in Brittany, also in all of the northern countries of Europe and in Britain, a ravine was called a clough, a word that was derived from an ancient verb that was translated, “to split.” In “The History of the Commoners” by John Burke, a statement is given on the authority of Dr. Johnson and other lexicographers, “This family-Clough-its name and arms deduce from the Lords of Rohan in the dukedom.” Rohan was a small viscounty, later erected into a duchy, in Brittany or Bretagne in France when William, The Norman, invaded that province about 1050 A. D. This was the ancient Celtic province that Julius Caesar described in his Commentaries. Standing upon the crags of its coast~ Caesar caught sight of the shining white cliffs across the channel and found a new territory to conquer in Britain. From John Burke’s writings one may learn that the Lords of Rohan were descendants of the ancient kings and princes of Bretagne, titles that, judged by the modern point of view, seem more or less legendary. Yet in those long ago days, only the warriors were chosen Lords and Kings who achieved and then retained their positions of power by their deeds of valor and courage. Brittany is described as a rugged region, traversed by beautiful valleys and romantic glens where swift rivers flow into the sea. Even in 1580, a Duke of Rohan was born in Castle Blain who was a famous man of letters and an officer in the religious wars of that century. 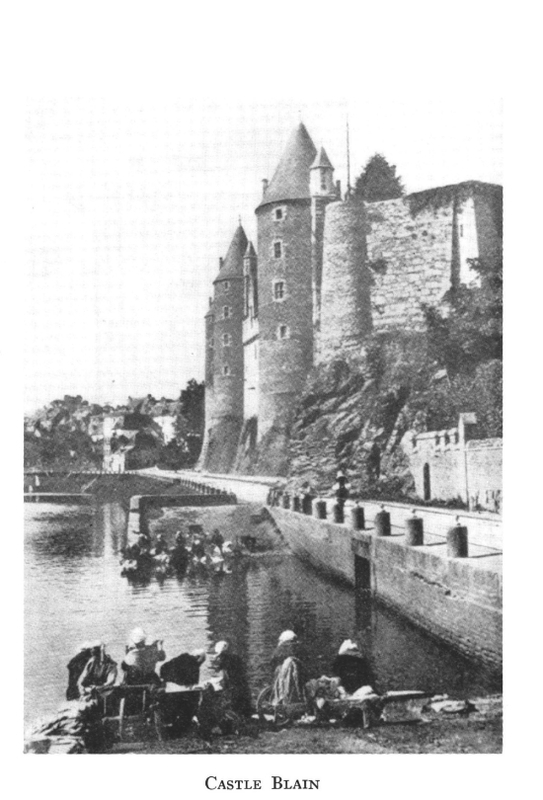 Blain is a city situated in the Vilaine Valley not far distant from the seaport of St. Nazaire. In this vicinity the Cloughs received their name and arms. During the reign of William, The Norman, the inhabitants of this duchy obeyed the Conqueror, and the Lords with their clansmen joined his armies in his conquest of Britain in 1066. Gradually the Norman henchmen were assigned areas among the Cheviot Hills along the northern border of England between the estates of the Saxon nobility where they acted as guards to enforce the regulations of William, The Conqueror. Without doubt among these Norman watchmen there were Cloughs, men who loved the highlands and who settled among them. The name survives near the coast of Yorkshire not far from Whitby where a town is called Cloughton; and in Westmoreland County the Clough River flows into the Luna above Lancaster. Naturally the Norman warriors fell in love with the blue eyed, flaxen haired daughters of their Saxon neighbors and intermarriage wrought confusion with the family name of the Cloughs. Only a philologist would attempt to solve the puzzle of either the spelling or the pronunciation. In Old English the derivation of the word, clough, is from cloeftan, meaning to split, which introduces the letter “f” into the spelling. Also in Icelandic, klofi means a rift in a hillside. The Dutch kloff is a flowery glen. According to dictionaries, the guttural “ch” was originally an “f” in old English or Saxon and the noun meaning split was spelled “clufe.” Middle English, which was the Saxon dialects modified by the introduction of the Norman French, spelled the name, Clough. In addition a Scotch cleugh and an English clove, both meaning to split, helped to influence the pronunciation to clow which in the plural became clewes and clowes. The Ordinance Survey in England altered the spelling of all forms of the name to Clough and in all the books on Heraldry the same spelling is adopted. At present, uniformity does not exist even among persons of the same branch of the family; each person is his own guide according to personal preference. Again quoting John Burke, “The first settlement in England of this family appears in an ancient deed from Whaley Cartulary bearing the date 1316, being in the northern counties.” A cartulary was an official record of a monastery. This deed is evidently the first documentary evidence of the Cloughs in England. Definite records of Robert del Clogh existed in Lancashire in 1332, and of William de Clowe in Yorkshire in 1379, and a Henry de Cloghe in Yorkshire about the same time, which is an indication that branches of the family were among the landed gentry in the fourteenth century. Although this narrative about the origin of the name is convincing, the arms of the family offer additional proof that the Lords of Rohan were its original progenitors. It is common knowledge that picture writing was the first medium that was evolved to convey messages by signs in prehistoric days. Later men devised emblems to distinguish the identity of a family or an individual. The ancient emblem or mark of the Cloughs was a mascle, and their war cry was “Sine Macula Macula,” John Burke quotes as his authority for the above assertion from an ancient article on the Science of Heraldry by Colomtriere which states, “I am of the opinion that the Lords of Rohan, who I believe are the first who bore these figures on their arms, assumed them because in the most ancient viscounty of Rohan there are an abundance of small flints which being cut in two, this figure appears on the inside of them; the carp too which are found in fish-ponds, exhibit a similar mark on their scales peculiar to this country or duchy of Rohan and Extraordinary. These circumstances so very peculiar to the country, and at the same time extraordinary, the ancient lords adopted the figures for their arms and transmitted them to their posterity, giving them the name of mascles from the Latin word macula whence some of the houses have taken for their motto, “Sine macula macla-a mascle without a spot.” From the above quotation, this figure and the motto belong to the Clough Family as a whole and are valid emblems for any member to assume. In shape the mascle is a rhombus or diamond which in England is called a lozenge. The steel plates of mediaeval armor were lozenge shaped; the panes of many old casement windows were lozenges. In English Heraldry, a lozenge or masc1e was a bearing in the form of a lozenge perforated or voided so that the field appeared through the opening. This bearing was never charged with any other. To understand the significance of the “Mascle without a Spot,” some explanation about the customary use of this figure is necessary. Among early merchants the masc1e, meaning a spot, was adopted as a sort of trade mark to indicate an imperfection, such as a blemish in a fabric or a flaw in a jewel. The spelling is an erroneous form of the French made, derived from the Latin macula, meaning a spot. When ancient symbolism developed into Heraldry, first on the continent of Europe, later into English Heraldry, as a science, the old war cries became the mottoes of the Houses. 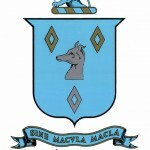 “Sine macula” explained that the mascle that was charged upon the escutcheon did not suggest dishonor, rather that the family was without disgrace and no sinister stain was imputed by this ancient figure. 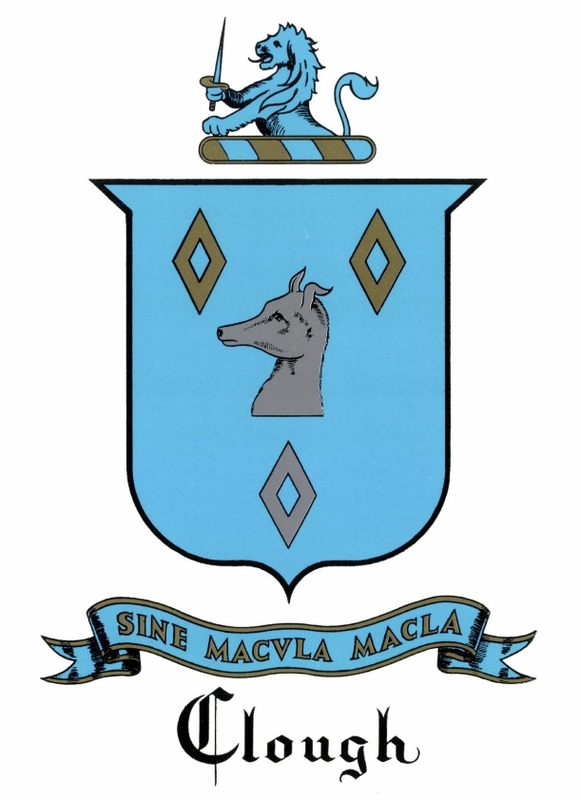 The coat-of-arms that is included among the illustrations in this book cannot be claimed as the insignia of the John Clough Branch of the family. From present knowledge, this is the earliest device that was assumed by a Clough. Either late in the twelfth or early in the thirteenth century Heraldry was introduced into England and Wales. After 1300 Hugh Clough of Wales was granted this insignia which descended to Sir Richard Clough at Llewene Green in Denbigh in northern Wales before the fifteenth century. No claim to a coat-of-arms is valid unless authorized by the Officers of Arms either in London, Edinboro, or Dublin, and the right to the armorial bearings has been registered in the Bureau of Heraldry in one of these cities. To display arms without proof of ownership is a form of forgery, since in the days of chivalry the coat-of-arms was the device by which a knight in armor was recognized and the crest was equivalent to his legal signature. The first famous Clough in English history was Sir Richard, The Hen. Because he lived during the reign of Henry VII, Henry VIII, Edward VI, Queen Mary, and Queen Elizabeth, he was called by this title of respect, The Hen, meaning The Old. He was married during the reign of Henry VIII and resided on his estate at Llewene Green. Five sons and a daughter were born. His fifth son received the title, Sir Richard, a Knight of the Holy Sepulchre, an honor conferred after his pilgrimage to the Holy Land. With knighthood he was granted a right to an augmentation to his escutcheon, a recognition that was never bestowed except by the sovereign under a royal warrant, never by the Officer of Arms, and was a coveted mark of royal favor. On his shield he was granted a chief of silver charged with the Jerusalem Cross between four cross-crosslets in red, on either side a crusader’s sword upright with gold handle, and below a lion passant. After his return from the Holy Land, Sir Richard was associated with Sir Thomas Gresham, a wealthy merchant in London and a special financial representative of Queen Elizabeth on the continent. His manipulation of the pound sterling in Antwerp was said to have been transacted by unfair methods, nevertheless he was popular at court because the royal coffers were overflowing from these rates of exchange. John Burke states that, at the suggestion of Sir Richard Clough, in 1565 Sir Thomas Gresham erected the Royal Exchange building in London. Previously, the foreign and English merchants transacted their sales in a narrow street, exposed to all sorts of weather, rain or shine. The venture proved profitable to Sir Thomas who derived an annual income of seven hundred pounds from rents of shops that occupied rooms above the Exchange, but were not opened until a year after Sir Richard died. Sir Richard accumulated a considerable fortune. On his paternal estate in Denbigh he erected his mansion, Plas Clough, now occupied by his descendants. He presented other estates to each of his two daughters, one of them at Bachecrag near Denbigh. Sir Richard died at Antwerp in 1570. His descendants were….